Lydia Higginson didn’t really know where dressed. would fit amongst the thousands of shows at the Edinburgh Fringe. She didn’t know what reviewers would say. She didn’t know what she wanted them to say, either, and so what they said didn’t feel right. Now dressed. has won a Fringe First Award, transferred to Battersea Arts Centre, and is about to go on tour. But these accolades don’t make the reviewer’s job any easier. The fact remains that this is a unique show that defies categorisation, and that basic words like ‘hilarious’ or ‘heart-warming’, can’t hope to describe. So, what is the show about? On the surface, it is about the power of creativity as a means of overcoming trauma. After being stripped at gunpoint, Lydia moves back home, locks herself in her room, and learns to sew. The first four garments she makes are costumes; by January 2017, she has made her entire wardrobe and given all her shop-bought clothes away. In dressing herself, Lydia is able to reclaim herself, to take back the body that was wrenched out of her control. On its own, Lydia’s story is arresting and, dare I say it, inspiring. But the thing that makes it so special is the way in which it is told. Lydia performs alongside three of her friends – Josie, Olivia, and Nobahar – who dance with her, sing with her, and wear her costumes. But, most importantly, they enjoy themselves. In spite of the dark subject matter, dressed. is overwhelmed by a sense of joy. It feels as though they made this show purely because they wanted to make it: not out of vanity, but because they felt that this story deserved to be told. No it’s not polished, and yes the microphone wires keep getting caught on bits of the set – but who cares? It is rare to see performers as joyous and free as these four women are. The roughness of the show should not be mistaken for a lack of professionalism: it is beautifully executed. All four performers are energetic and charismatic, each contributing something unique. Olivia Norris is a mesmerising dancer; Nobahar Mahdavi is a captivating singer. Josie Dale-Jones’ subtle humour brings comic relief, whilst Lydia herself is unflinchingly honest and direct. Lucy Adams’ lighting design matches and enhances the changes in tone, whilst the relatively bare stage is perfect for both dance numbers and quiet moments of sewing. If I had to choose one word to describe dressed., it would be “celebratory”. It is a celebration, not only of creativity, reclamation, and Lydia herself, but of friendship. 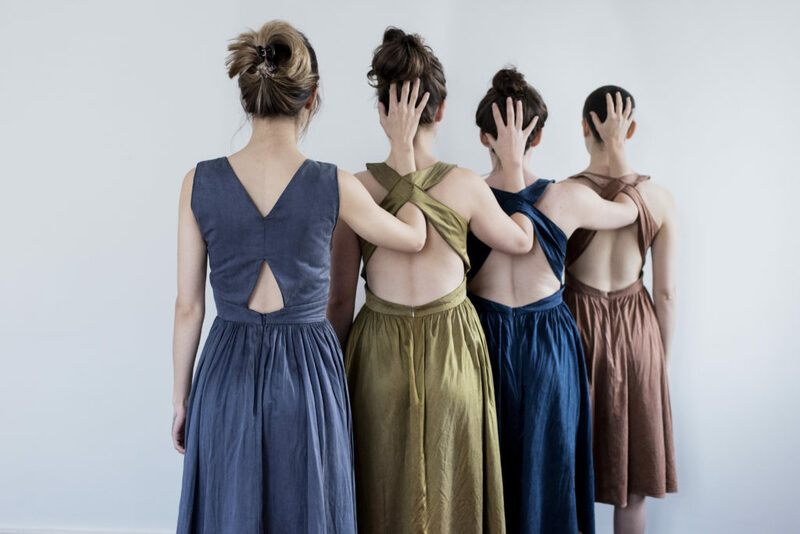 It is the story of four girls who met at a dance class when they were ten years old, and who now, as women, exemplify the beauty and power of friendship during dark times. Their love, for each other and for what they have created, is a reminder that theatre cannot be made without it.